Heinrich Marschner’s 1828 “Gothic” opera Der Vampyr is set in England, the characters have names such as Lord Ruthven and Sir Humphrey, Edgar Aubry and George Dibdin. 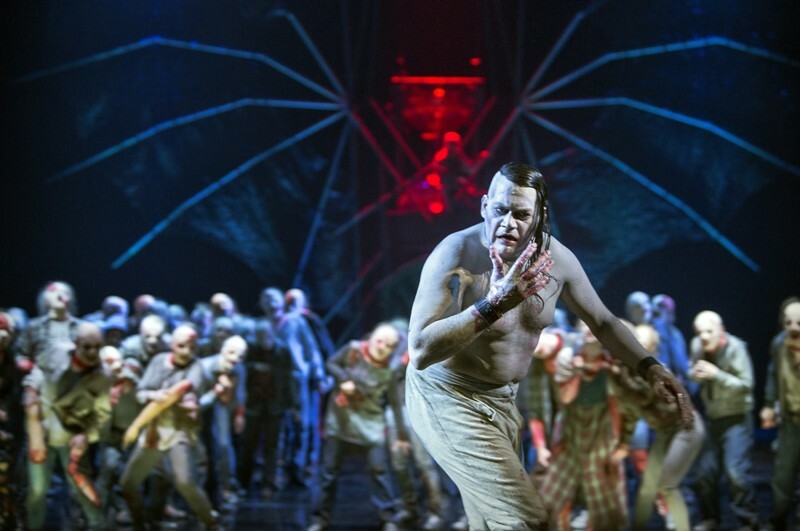 The darkly rousing music has a touch of Freischütz about it, but also British ballad opera. And the way this gem from the German Romantic period was presented now at the Komische Oper Berlin would have you believe that Der Vampyr is a close-cousin of Gilbert & Sullivan’s Ruddigore (1887). 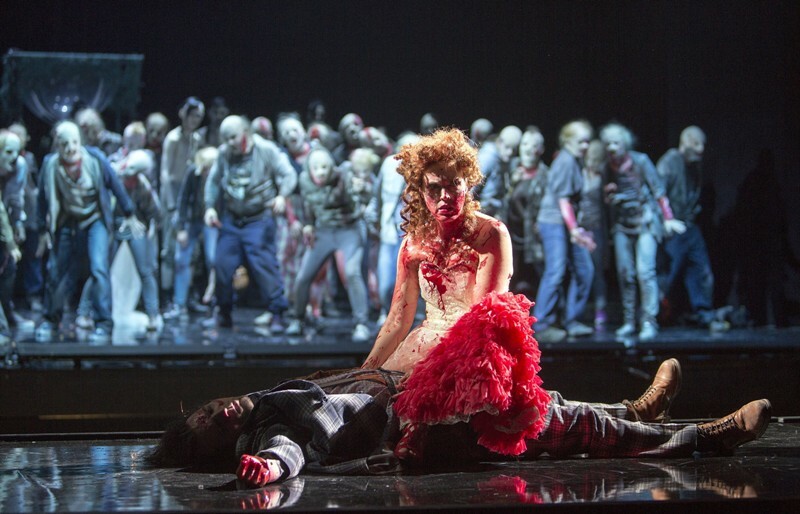 The reason for this G&S association is principally a question of performance style: director Antú Romero Nunes has staged this opera as a mix between a splatter/trash comedy with walking zombies, and a send-up of a mock Italian belcanto opera. Given the exalted acting of Nichole Chevalier as the heroine Malwina (bride-to-be of the vampyr Ruthven), it all seemed and sounded like a perfect parody. 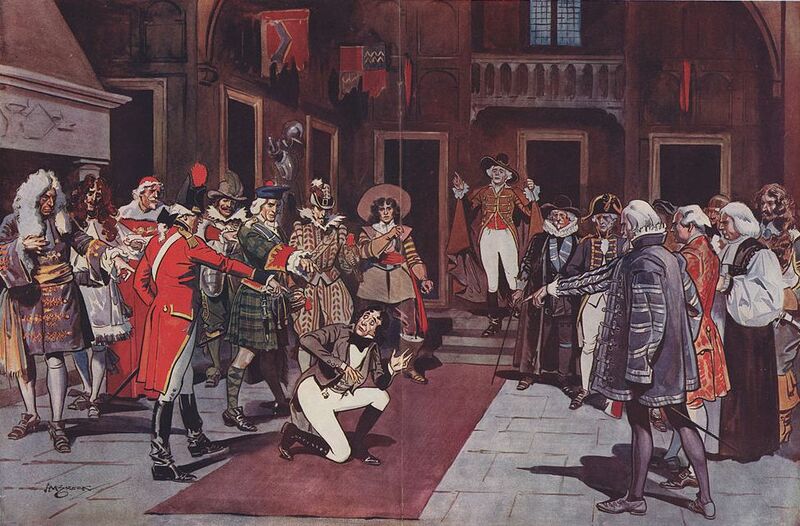 And as Carolyn Williams has already pointed out in her study Gilbert & Sullivan, the danger with parody is, that it often sounds like what it parodies, so performers are sometimes tempted to perform the parodistic as “real.” Here, however, you get the exact opposite: the Komische Oper cast performs the “real” Romantic music like parody. This is not without charm, and it certainly is entertaining. Perhaps it’s also typical for our times that young stage directors and their team cannot imagine this kind of story-with-music could in any way be taken seriously. On the other hand, conductor Antony Hermus takes the score very seriously. Even though it is cut down to 1 ½ hours, these 90 minutes you hear are truly exciting. I would even say that the orchestra of the Komische Oper has rarely sounded so energetic and keen in their playing (in classic opera repertoire) than under the baton of Mr. Hermus. Let’s hope he returns to the house often, and soon. The tenor role of Edgar Aubry was taken by Hungarian guest Zoltán Nyári, who looked pretty cool in his checked suit outfit, but sounded very labored throughout. While he had delivered an adequate performance recently as Mr. X in Kalman’s Zirkusprinzessin, he had severe problems with the lyrical phrases in Marschner’s score. On the other hand, Ivan Turšić as the young George Dibdin demonstrated the sweet belcanto singing you would have wished for all around. 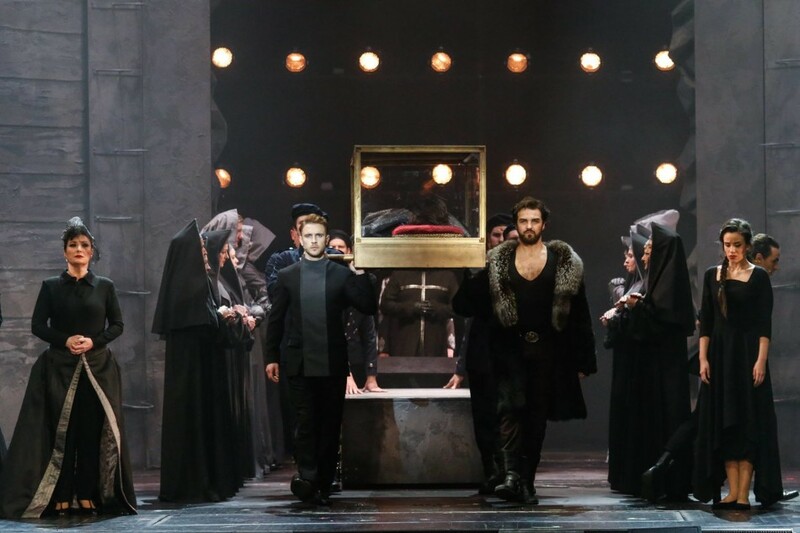 With their sharp character performances, their fun to go over board and have blood splatter all over the place, these soloists would be perfect for a Savoy Opera. And Heiko Trinsinger as Berlin’s new Vampyr would be ideal as the “other” Ruthven: Sir Ruthven Murgatroyd. Scene from the 1921 revival of “Ruddigore” by the D’Oyly Carte Company. sorry I have to disagree, cutting nearly one half of the original music, cutting ALL the dialogue and interpolating additional trashy “modern” music to fix the gaps says a lot about the respect the metteur-en-scene has for this very important early opera, the prerunner to wagners holländer and one of the important trrias at the beginning of the 19th century. 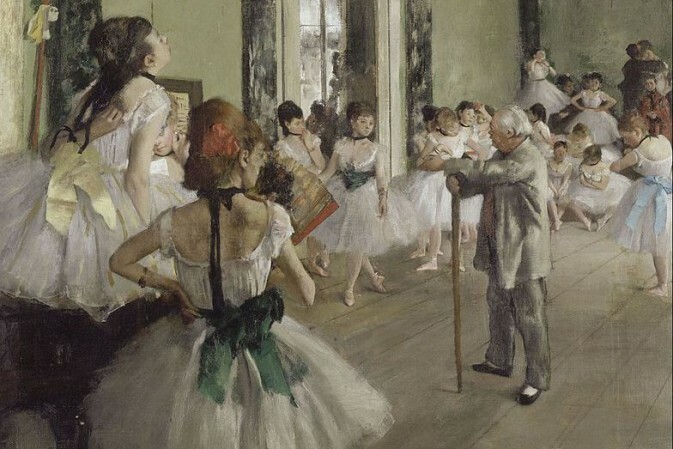 gothic opera is no musical but has important historical and social connections. sorry. this is blatant ignorance – as usual. another rocky horrort show. why then do it if one cannot recognize the original piece any more? no-one of the younger ones have ever seen this on stage. so its easy to sell it as the quasi-orginal. ignorance and assumption! do NOT go there! its a fraud. As Erik Urban wrote in the BZ AM MITTAG, 1927 about Erik Charell’s totally rewritten MIKADO: “Erich Urban von der BZ am Mittag sah in dieser Art Modernisierung alter Werke den Weg zur Renaissance der Operette: “[E]in Mikado à la mode, à l’americain, à la Charell. Aus dem Orchester steigt eine Musik auf, die Sullivan in Jazz-Seligkeit fortreißt. [...[ Befruchtet von der glühenden Phantasie Ernst Sterns wird der Übergang gefunden zu den Erscheinungen des Jahres 1927. Regie-Fülle, Bändigung und neue Gesichtswinkel – das ist Eri[k] Charell im Mikado geglückt. Ich bekenne, daß man die alte Operette nur so spielen darf, daß man ihre Seele nimmt und sie in einen neuen, springlebendigen Körper setzt. Nur keine falsche Scham!” Maybe this VAMPYR is the modern-day equivalent to this? It remains to be seen how “springlebendig” the new version of this show will prove. When I played my CD of Vampyr (1974 Munich perf) I immediately noted that the interrupted wedding chorus of the finale must be deliberately parodied in Ruddygore Act I; I don’t know how well-known Vampyr was in England. Must get my passport in order; I missed Hans Heiling at Vienna. There was a new version done here in Boston, Mass USA in 2014; different plot but same music. I went twice.